High performance commercial-grade component, yet fast and easy to install in home or small office environment. Field configurable and do not require the use of extra tools or epoxy. The thread-lock connector affixes to the fiber by simply screwing onto a tapered threaded connector body. 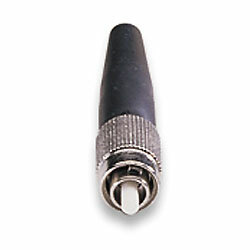 The connector can, if necessary, be removed and reinstalled without damaging the fiber cables. This allows connectors to screw on and off of fiber cables without being damaged, so connectors can be re-installed, if necessary. Connectors comply with the TIA/EIA-568-A and meet industry standards for performance and tensile strength.